Mashed potatoes are as much a part of the American Thanksgiving experience as the turkey itself. While I have been spending time talking turkey with you, I have neglected to take about the mashed spud yet. It’s time for that to change. Have you come across a mashed potato recipe that calls for a ricer? Did you think that this is some old fashion gadget that you find buried in the bottom of your grandma’s utilize drawer? Is it this a tool worthy of being passed down to the next generation. I was given a ricer for Christmas one year, not sure what I was going to do with it. When I saw Alton Brown call for one in a recipe for Whipped Yukon Gold potatoes I was excited to try out. After I did I found out why this tool is so useful, it helps produce outstanding mashed potatoes. A food as comforting as mashed potatoes, make a ricer not just an ordinary kitchen tool, but dare I say a stress reducer! Forget the therapy sesssions, buy a ricer! What Does a Ricer Do? If you ever made mashed potatoes that turn out gummy – a ricer is the key tool to prevent this from happening. The reason is happens is that the starch in the potatoes are swollen, ready to burst. If you agitate the potatoes too much they will explode – thus gummy potatoes. A ricer helps break the potatoes into small bites. The starch in the potatoes will not swell up into huge chunks if you break them down into tiny piece. 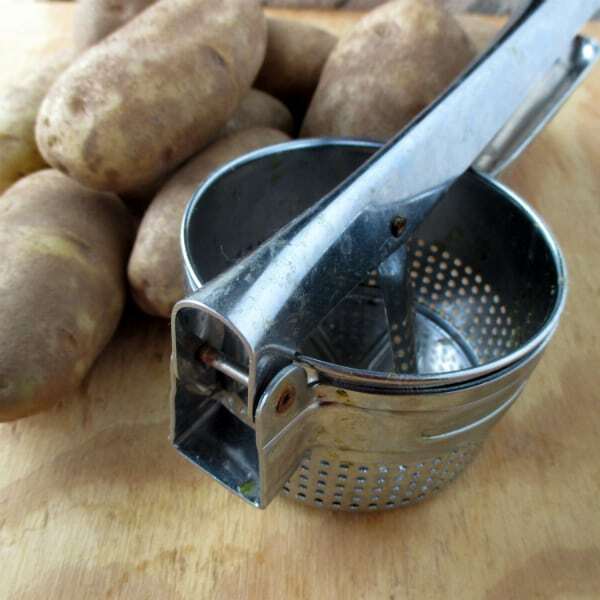 Then all you need is to get the potatoes a quick wipe with a hand mixer to smooth them out and you will have light and fluffy potatoes that are anything but gummy. While mashed potatoes are the best reason to get a ricer there are others. You can use them for sweet potatoes and squash. I heard one person uses them to dry out their cooked spinach. You could use it to make apple or tomato sauce, to remove the skins or seeds, though I find a food mill works better for sauces. Could be useful for making baby food. Previous Post: « What Type of Turkey Would Alton Brown Buy?